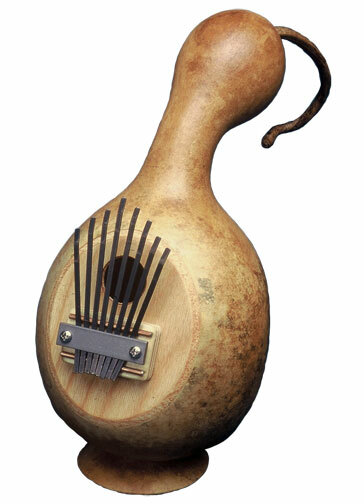 Make a drum, thunderdrum or a kalimba! 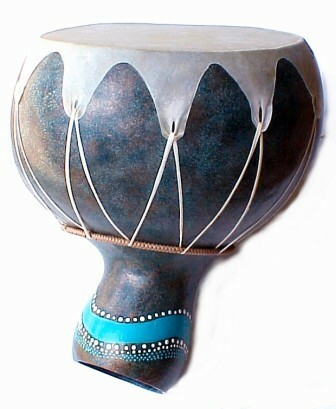 Drums are made with a variety of techniques, from simply gluing a drum head onto a gourd, to complicated wrapped and woven application techniques. 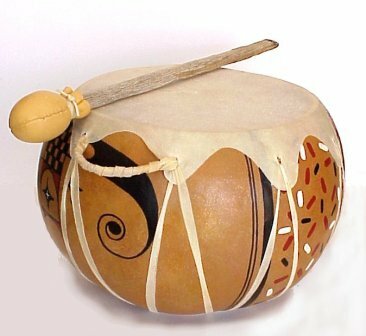 Round, lightweight goatskin rawhide drum covers are the best choice for gourd drums and hand drums. Order by diameter - sizes may vary slightly within the stated range. Often it is advantageous to order a larger size than you think you will need. 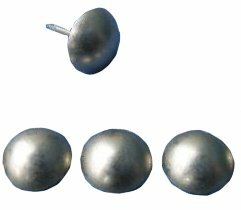 The excess can be used to make jewelry, or make several small drums from one large skin. These big drums were made using a large drum skin. Depending on the size of your gourd, rawhide lacing can sometimes be cut from the same skin as the head if the skin is sufficiently thick enough. Hint: To cut rawhide lacing, use sharp shears. Start at the outer edge of the skin and cut a strip 1/4 - 3/8" away from the edge. Continue cutting in a long spiral around and around the outside edge of the skin until you have a sufficient length of lacing for your project. Thinner skins may be stapled on. After they are dry, cut off the excess skin and cover the row of staples with decorative leather or braiding and decorative tacks. 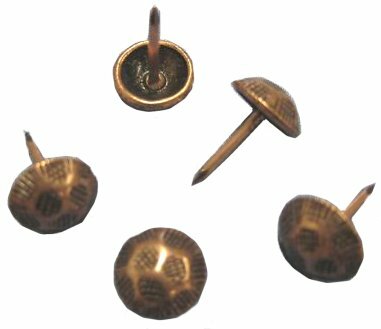 You may have to use a pair of heavy wirecutters to snip off excess length on the tacks. 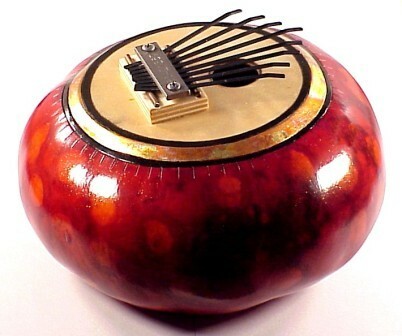 Create your own Thumb Piano! These kits come with all the parts you need except for the gourd, You can make these using many different types of gourds including bottle, canteen and others. 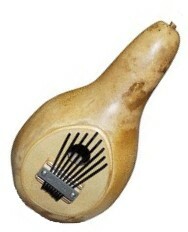 (The one pictured below is made with a canteen gourd.) 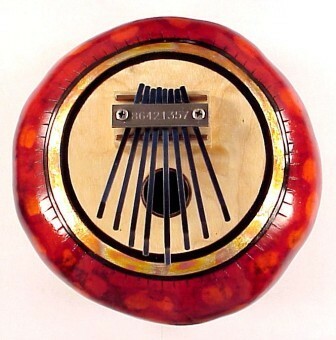 These kits are 8 note diatonic scale kits, which may be retuned to pentatonic if desired. Instructions for assembly and playing basic tunes are provided. 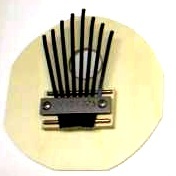 Thunder drum springs with attached bead. 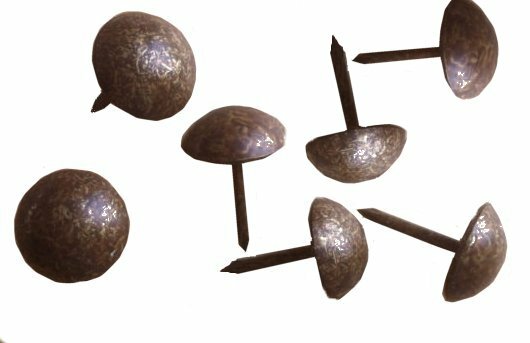 These are ready to add to your thunder drum projects. Pair with a rawhide drumskin like those above, or use a mylar membrane. Both work fine. 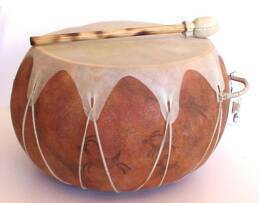 : Thunder Drum by Kathe Stark.